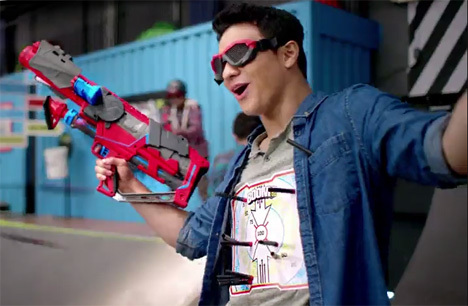 When you think of foam dart-blasting guns, Nerf is probably the first name that pops into your head. Mattell has unveiled a line of blasters that have the potential to knock king Nerf from its throne. Called BOOMco, the guns themselves are attractive, but nothing extraordinary. What’s really interesting is the darts. Until now, the standard type of projectile bursting forward from this type of plastic gun was a highly inefficient dart with a suction tip. They had to be aimed carefully at a flat surface in order to stick – and even then, they only stuck about 20% of the time. Other darts, with tips made of that weird sticky stuff, were collectors of lint and pet hair, rendering them useless rather quickly. Matell’s Chem Lab spent years creating SmartStick, an indisputably superior dart-sticking adhesive. SmartStick is smart enough to stick only to its designated targets. It won’t adhere to walls, skin, clothes, animals, or anything other than the BOOMco targets. The proprietary technology doesn’t lose stickiness over time; it can stick and re-stick without accumulating gunk or becoming worn out. Your dart gun battles are about to get way more awesome.